Yuhoo I’m back, at last! I have been lazy to update my bloggie for the past few days and ouh furthermore I have been busy too with so many things to do. Where should I start first? Actually there weren’t anything extraordinary or happening things happened so I can’t recall any at the first thought except of course being sulked. I think that maybe I am born to sulk. Like the Maybelline branding words, “Maybe she is born with it” hehehe of course not! I wouldn’t sulk if there wasn’t someone who actually caused me to feel so. Who is that ‘someone’? =P hohoho! Gosh! I can’t believe that it is actually snowing outside. It is not that I am excited to see the snow falling but it hasn’t been snowing at all anymore since that day. Ever since even the weather forecasted actually showed the snowing sign and the weather were been low than 0 but at the end it has only been raining. The temperature also seems to be in rising mode, but it looks like today is an exception. It is -3 degree Celsius now and no wonder I feel so cold today. However, it is only snowing very little at this time. I’ll see how it will go then. 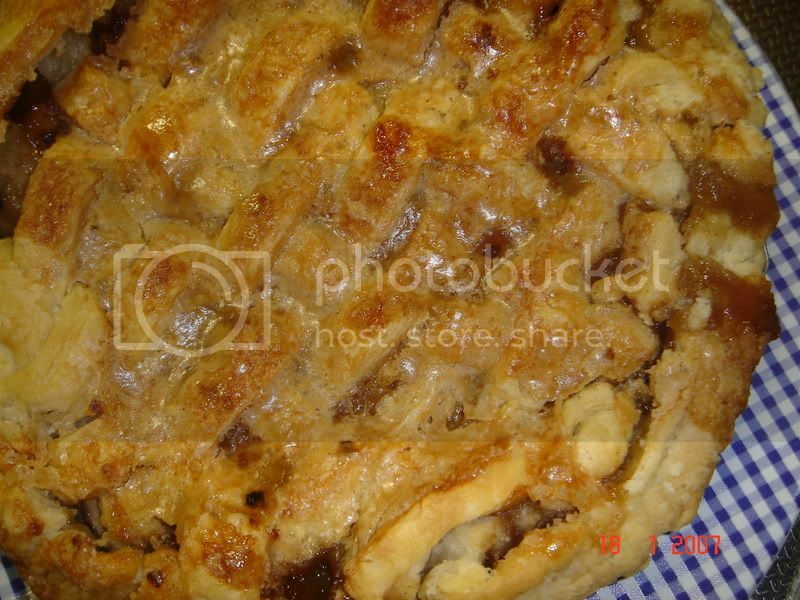 Thanks to Zack for sharing such a very delicious apple pie recipe. I did my pie exactly step-by-step according to the recipe’s directions and the pie turned out very crusty. I also tried to imitate Zack’s lattice work on my pie but it didn’t turn out as superb as Zack’s =D Still, I’m satisfied since it was my first time to make the apple pie of this kind. However, I think next time I will just put less sugar since it turned out to be super-sweet for me. ***I just copy from Zack’s page. Melt butter in a sauce pan. Stir in flour to form a paste. Add white sugar, brown sugar, spices and water; bring to a boil. Reduce temperature, and simmer 5 minutes. Meanwhile, place the bottom crust in your pan. Fill with apples, mounded slightly. Cover with a lattice work of crust. Gently pour the sugar and butter liquid over the crust. Pour slowly so that it does not run off. Note: I used only 3 to 4 ordinary Japan fresh apples instead of using 8 Granny smith apples. Maybe my pan is a little bit smaller to put in all 8 apples cubes. Furthermore, I don’t actually know Granny smith apples and how big usually it is. As for the crust, same as Zack; I didn’t buy those ready-made crust pie but I made one myself according to Zack’s recipe. Place flour and salt in a clean bowl. Cut out you butter into small cubes. (If you’re using shortening, make sure the shortening is well chilled. Just scoop it using spoon into small lumps). Insert the butter into the flour and using the tips of your finger, pinch the butter into the mixture until you get small lumps no smaller than the size of a pea. If you have a pastry cutter, then use that to mix the butter and the flour. Pour in the water a bit at a time, gently mixing it with the flour using a fork or a spoon. If you need to use your hands, avoid handling the dough too much. Split dough into 2 equal rolls and wrap in a plastic wrap and chill for at least 30 minutes to an hour. Take out the dough from the fridge and dust your working surface, your rolling pin and the top of the dough with some flour. Start rolling at the center of the dough and work outwards. The size of the circle should be about four inches wider in diameter than the pan. A trick for getting the dough positioned in the pan correctly is to fold the dough in half and then into quarters. Gently pick it up and place it into the pan so that the center point is in the center of the pan. Press the crust firmly into the pan and trim any excess dough from the edge. Leave a 1/2 inch flap of dough around the edge for fluting or to use when sealing on the top crust. Note: Measure and chill all the ingredients in the fridge before you work with it. Make sure you chill all the ingredients before using it. Chilling will prevent the fat pieces from dissolving into the flour. If the butter melted, the pie crust will be very hard. When mixing the butter into the flour, handle it as little as possible. Even if there is any seen butter lumps, it’s okay. That’s what makes the pie crust crispy later on. When you are mixing the butter with the flour and the butter seems like starting to melt, put the mixture into the fridge for a while then only you continue mixing them. To make a more flaky crust, starts to roll out the dough ups and downs so that it will be longer but not rounder. Then fold the top side to the center and also same goes to for the bottom side. Put the dough upside downwards and roll the dough ups and downs again. Repeat the step one more time, wrap it with plastic wrapper then keep it in fridge for 1 hour. (This steps been done only after the doughs have been kept in the fridge for 30 minutes). And the most basic tip of all time when making a pie, MAKE IT COLD, BAKE IT HOT! Note: The ingredients for the dough should be chilled and so does the filling or else the pie crust will melt one you pour in the filling. Make sure the oven is pre-heated first and bake the pie in high temperature. I have it with slices of tomato and chillie sauce. This is another recipe that also I have got from Zack’s and Zairul Fotopages. I bake this for dinner once and definitely I’m going to make this again someday. Unfortunately, I didn’t actually follow the original recipe but prepared my beef mixture according to Bolognese spaghetti sauce recipe. 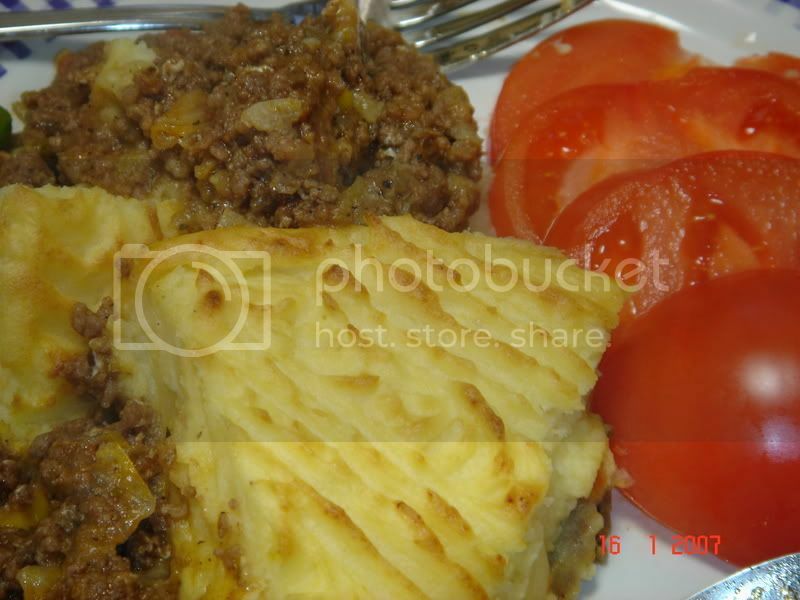 Unluckily, due to my mistakes and carelessness somewhere, the beef mixture taste didn’t turn out so right, as for more to go with the mashed potatoes. So, next time I will just follow the original recipe and also will make a cream sauce which actually I saw how to make it from the tv. Brown ground beef and saute onions in 2 tablespoons butter until golden. Mix ground beef with onions, ketchup, Worcestershire sauce, oregano leaves,　paprika, salt, sugar and pepper. Add a few tablespoons of beef broth mixed with flour and cook, covered, over low heat for 15 to 20 minutes, adding more beef broth as necessary to keep moist. Beat egg yolks until light, then in another bowl, beat whites until stiff. Then, add in the yolks, cream, 6 tablespoons butter, and garlic powder into hot mashed potatoes. Fold in beaten egg whites. Put meat mixture into a casserole then top with potato mixture. 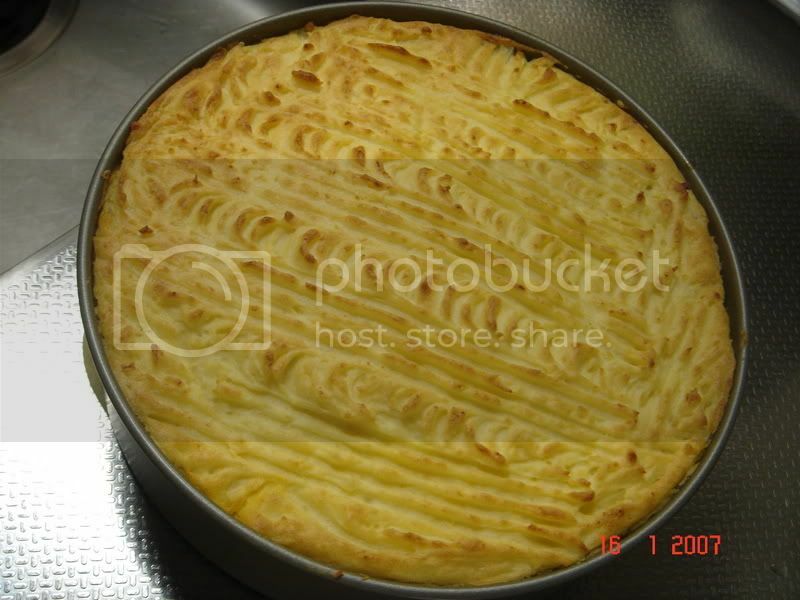 Sprinkle with grated cheese and bake at 240°C until potato topping is puffed and browned, about 25 to 35 minutes (if you don’t want to put cheese on top of it, you can use a fork to make some designs on the potato too). Okay that’s all for today. Hmm seems like it is already stopped snowing and the atmosphere is back to sunny. Ouh the black clouds have been blown to the other side nearer to the hill, now it must be snowing there.